Alexandria, Virginia (CNN) – A few hundred Mormons filed into a chapel just outside the Washington Beltway one recent Sunday to hear a somewhat unusual presentation: an Obama administration official recounting his conversion to Mormonism. “I have never in my life had a more powerful experience than that spiritual moment when the spirit of Christ testified to me that the Book of Mormon is true,” Larry Echo Hawk told the audience, which stretched back through the spacious sanctuary and into a gymnasium in the rear. Echo Hawk’s tear-stained testimonial stands out for a couple of reasons: The White House normally doesn’t dispatch senior staff to bare their souls, and Mormons hew heavily Republican. It’s not every day a top Democrat speaks from a pulpit owned by the Church of Jesus Christ of Latter-day Saints. And yet the presentation by Echo Hawk, then head of the U.S. Bureau of Indian Affairs, is also a perfect symbol of a phenomenon that could culminate in Mitt Romney’s arrival at 1600 Pennsylvania Avenue next year: The nation’s capital has become a Mormon stronghold, with Latter-day Saints playing a big and growing role in the Washington establishment. The well-dressed crowd gathered for Echo Hawk’s speech was dotted with examples of inside-the-beltway Mormon power. In one pew sits a Mormon stake president – a regional Mormon leader – who came to Washington to write speeches for Ronald Reagan and now runs a lobbying firm downtown. Behind him in the elegant but plain sanctuary – Mormon chapels are designed with an eye toward functionality and economy – is a retired executive secretary of the U.S. Supreme Court. A few pews further back, the special assistant to the U.S. Special Representative for Afghanistan and Pakistan sits next to a local Mormon bishop who came to Washington to work for Sen. Orrin Hatch of Utah and now leads a congressionally chartered foundation. 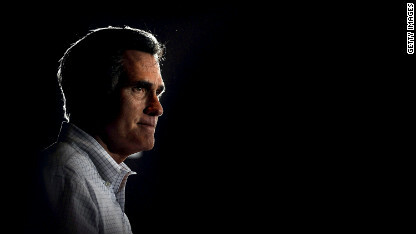 Mitt Romney, who would be the first Mormon president if elected, is the son of a Cabinet secretary under Richard Nixon. Regardless of which party controls the White House, Mormonism in Washington has been growing for decades. When Larsen arrived in Washington in the early ’80s, there were a just handful of Mormon meetinghouses in northern Virginia, where he lives. Today, there are more than 25, each housing three separate congregations, or wards, as they’re known in the LDS Church. “There’s been an absolute explosion in Mormon growth inside the beltway,” Larsen says before slipping out of the pew to crank the air conditioning for the swelling crowd. The LDS Church says there are 13,000 active members within a 10-mile radius of Washington, though the area’s Mormon temple serves a much larger population – 148,000 Latter-day Saints, stretching from parts of South Carolina to New Jersey. Signs of the local Mormon population boom transcend the walls of the temple and meetinghouses. Crystal City, a Virginia neighborhood just across the Potomac River from Washington, has become so popular with young Mormons that it’s known as “Little Provo,” after the Utah city that’s home to church-owned Brigham Young University. Congress now counts 15 Mormon members, including Senate Majority Leader Harry Reid, according to the Pew Forum on Religion and Public Life. That means the 2% of the country that’s Mormon is slightly overrepresented on Capitol Hill. 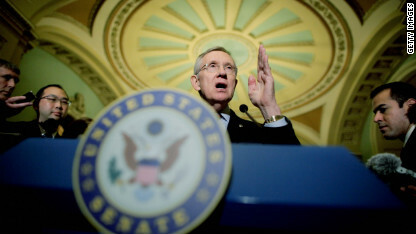 Senate Majority Leader Harry Reid, a Democrat, is the highest-placed elected Mormon in Washington. Even many Latter-day Saints joke about Washington’s “Mormon mafia” – referring to the number of well-placed LDS Church members across town – though they cringe at the thought of being seen as part of some cabal. (Echo Hawk, for his part, left the Obama administration a few weeks after his chapel presentation for a job in the LDS Church hierarchy). Bushman and other experts note that, despite Mormons’ growing political power, the official church mostly steers clear of politics. It’s hard to point to federal legislation or a White House initiative that bears distinctly Mormon fingerprints, while it’s easy to do the same for other faiths. For example, the White House’s recent “compromise” on a rule that would have required religious groups to fund contraception for employees was mostly a reaction to pressure from Roman Catholic bishops. Nonetheless, Mormon success in Washington is a testament to distinctly Mormon values, shedding light into the heart of one of America’s fastest-growing religions. And though the official church is mostly apolitical, most rank-and-file Mormons have linked arms with the GOP. Romney’s own political evolution mirrors that trend. Such forces help explain why Mormons’ beltway power is poised to grow even stronger in coming years, whether or not Romney wins the White House. For many Washington Mormons, religion plays a key role in explaining why they’re here. Larsen, who sports a brown comb-over and tortoise shell glasses, arrived in Washington in the early 1980s as an intern for Hatch, also a Mormon. He landed the internship courtesy of Brigham Young University, his alma mater. The Mormon school owns a four-story dorm on Pennsylvania Avenue, not too far from the White House, which houses 120 student interns each year. It’s the school’s largest such program in the nation. It’s a perfect characterization of Larsen. He grew up in Provo, in the shadow of BYU, and wanted to prove he could make it outside of Utah. “Kids growing up in the LDS Church have been told, ‘Go ye out in the world and preach the gospel of Christ - don’t be afraid to be an example,’ ” Larsen said, sitting in the glass-doored conference room of the foundation he runs on K Street. For Larsen, that usually means correcting misinformation about Mormonism or explaining Mormon beliefs and practices – you really don’t drink coffee, ever? – over lunch with co-workers or at business functions, rather than on-the-job proselytizing. He learned about integrating work and faith from Hatch. He was initially shocked to discover that the senator prays in his office each morning. Larsen and Hatch developed what the bishop calls a “father-son” relationship, with the intern rising up through the ranks to become Hatch’s chief Washington fundraiser. Now, as the head of a foundation that educates teachers about the U.S. Constitution, the bishop helps other young Mormons with job leads and introductions. Larsen was appointed to the role by Hatch and the late U.S. Sen. Ted Kennedy. Much of Washington’s Mormon professional network is still anchored by BYU, which operates a handful of big, well-connected alumni groups with major Washington chapters. The most prominent is BYU’s Management Society, a global organization whose biggest chapter is in Washington. Patrice Pederson also knows how to work a Rolodex. A lifelong political activist, she moved from Utah to Washington last year and soon tapped into BYU’s local network. Pederson served as the U.S.-based campaign manager for Yeah Samake, a Mormon running for president in the West African nation of Mali. Samake traveled frequently to the U.S. to raise money and build political support, so Pederson enlisted the help of BYU’s Management Society and other groups to host events for the candidate. Both in Washington and across the U.S., many Mormons are watching his candidacy. “Members of the church on Capital Hill were anxious to introduce the candidate to other members of Congress,” says Pederson, sipping an herbal tea (Mormons eschew black leaf teas) in a strip mall Starbucks near her apartment in Alexandria, Virginia. Beyond making connections, many Washington Mormons say the LDS Church provides an ideal proving ground for careers here. Unlike most churches, it has no professional clergy; from the bishop to the organist, each role is filled by everyday Mormons, most of whom have other day jobs. As a result, Mormons take church leadership roles at an early age, speaking publicly at Sunday services almost as soon they learn to talk. “My kids grew up in the church, and we get together for three hours on Sundays, and each member needs to get up and speak,” says U.S. Rep. Jason Chaffetz, R-Utah. “By the time they graduate, they have all these speaking assignments that other teenagers just don’t have. 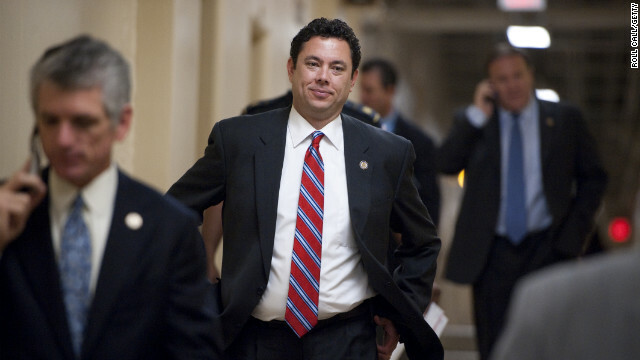 U.S. Rep. Jason Chaffetz, a Utah Republican, says Mormonism provides ideal training for aspiring politicians. “For those who grow up in the Mormon church, they are taught skills that allow them to be successful in a tough city like Washington,” says Chaffetz, who converted to Mormonism shortly after college. Young Mormons also hone leadership skills by serving missions away from home. The missions last from one and half to two years and happen when Mormons are in their late teens and early 20s and often include intensive foreign language training. Chaffetz, whose son is serving a mission in Ghana, says the experience is the perfect preparation for political careers. Christina Tomlinson served her mission in nonexotic Fresno, California. But working with the Laotian community there, she acquired the foreign language skills that landed her first internship at the U.S. State Department. 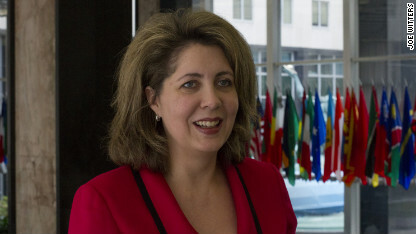 When she arrived at her foreign service orientation in the late 1990s, Tomlinson was surprised to find that a half-dozen of her State Department colleagues were also Mormon. The thriving LDS community at State even runs its own e-mail list server so Latter-day Saints can find each other wherever in the world they’re stationed. Like former presidential candidate Jon Huntsman, who used the Mandarin language skills acquired through a Mormon mission to Taiwan to help secure his job as President Barack Obama’s previous ambassador to China, Tomlinson leveraged her mission to get ahead at State, where she now serves as special assistant to the U.S. Special Representative for Afghanistan and Pakistan. “I’m basically the chief of staff for the president’s representative charged with implementing U.S. foreign policy towards Afghanistan and Pakistan,” she e-mailed on a recent plane ride back from the region. Language skills acquired on a Mormon mission helped Christina Tomlinson get her start at the State Department. But that distinctly Mormon patriotism was hard-won. From their very beginning, Mormons had tried to forge a special relationship with Washington. And for decades, they failed. Joseph Smith, who founded Mormonism in the 1830s, petitioned the U.S. government to protect his fledgling religious community from the violent persecution it was experiencing, even meeting repeatedly with President Martin Van Buren. But Washington refused, provoking Smith – who Mormons consider their founding prophet – to run for president himself in 1844. He was assassinated by an anti-Mormon mob in Illinois well before Election Day. In the face of such attacks, Mormons fled west, to the territory that’s now Utah. But they continued to seek ties with Washington, dispatching representatives to the capital to lobby for statehood. Congress refused to grant it. Instead, Uncle Sam disincorporated the LDS Church and sent the U.S. Army to police Mormon territory. In the eyes of Washington, Latter-day Saints were flouting federal law by practicing polygamy. 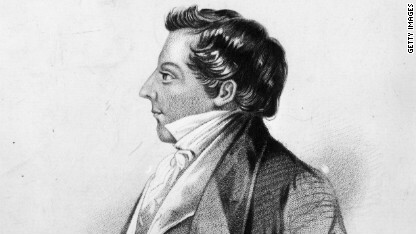 The feds saw the LDS Church as an undemocratic rival government that threatened Washington’s power. Joseph Smith, Mormonism’s founding prophet, ran for president in 1844 but was killed before Election Day. Mormons would eventually ban polygamy, paving the way for Utah statehood in 1896. But Congress nonetheless refused to seat the new state’s Mormon senator, who also served as a top church official. For four years, the U.S. Senate held hearings to grill U.S. Sen. Reed Smoot and other church leaders, alleging that Mormons continued to practice polygamy despite promises to the contrary. “The political trial was as much a galvanizing cultural moment as was Watergate,” says Kathleen Flake, a scholar of Mormonism at Vanderbilt University in Tenneessee. When Smoot was eventually seated – after the LDS Church took further steps to stamp out polygamy – he managed to become a Washington powerbroker. He would chair the Senate Finance Committee and act as a presidential adviser. Smoot’s unflagging pursuit of legitimacy in Washington, despite the city’s bias against him and his faith, symbolizes what many call a uniquely Mormon appreciation for American civic life. It helps explain the Mormon fascination with Washington to this day. It may seen counterintuitive, but Mormons’ early exposure to persecution at the hands of other Americans – aided, Mormons say, by the U.S. government – wound up strengthening their patriotic streak. In the face of attacks, Mormons clung to the U.S. Constitution and its unprecedented guarantee of religious freedom. They distinguished between the document and those charged with implementing it. Mormon scripture goes so far as to describe the U.S. Constitution as divinely inspired, establishing a unique environment in which Mormonism could emerge. Mormons began to shed their Utah-only siege mentality and fanned out in the early part of the 20th century. Their patriotic streak, which translated into military enlistments and applications for government jobs, led many to Washington. That wave included J. Willard Marriott, the hotel chain founder, who launched his business career by opening an A&W root beer stand here. He would go on to forge the kind of deep political connections that would help make Willard “Mitt” Romney his namesake. Washington’s Mormon community got another boost in the 1950s when President Dwight Eisenhower appointed a top church official, Ezra Taft Benson, as his agriculture secretary. As Mormons became more accepted, they became more upwardly mobile, landing in parts of the country that could sustain careers in commerce, academia and government - another reason Washington was a big draw. By the time there were enough Mormons in the eastern U.S. to justify the construction of the first Mormon temple east of the Mississippi River, the church chose a site just outside Washington. The temple opened in 1974, shortly after another high-profile Mormon – George Romney, Mitt’s father – left his post as Richard Nixon’s secretary of Housing and Urban Development. The Mormon temple outside Washington was the first such temple built east of the Mississippi River. Unlike Mormon meetinghouses, where members meet for Sunday worship, temples are grander buildings reserved for certain rites, such as proxy baptisms for the dead. To this day, the first monument many Washington visitors see isn’t a federal landmark. It’s the massive Mormon temple, its Georgian marble towers and gold-leafed spires looming above the trees on the Washington Beltway like an otherworldly castle. 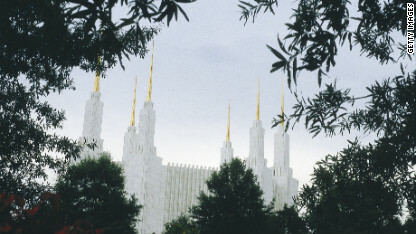 The temple houses a J. Willard Marriott-financed mural of Jesus Christ’s second coming, which features a picture of the Washington temple itself in the background. “Are you implying that the millennium will begin in Washington?” a temple visitor once asked Marriott, referring to Jesus’ return. These days, the Mormon impulse toward Washington is often as much political as patriotic. Patrice Pederson - the campaign manager for the Mormon running for president in Mali - made her first foray into politics at 15, hopping the bus from her home in the suburbs of Salt Lake City into town to intern with a Republican candidate for the U.S. House. When then-Vice President Al Gore visited Utah, Pederson protested his speech with a homemade poster that said “Blood, Guts & Gore – Healthcare’94.” (She can’t recall the poster’s exact meaning). Pederson’s path to D.C. speaks to the growing Mormon/Republican alliance since the 1960s, driven largely by the emergence of social issues such as abortion and gay marriage and the rise of the Christian Right. Pederson’s roommate, Kodie Ruzicka, grew up squarely in that movement, with her mom heading the Utah chapter of Eagle Forum, a conservative Christian group founded by rightwing icon Phyllis Schlafly. In the 1970s, when the Catholic Schlafly led a successful grassroots campaign against the Equal Rights Amendment, which would have made gender-based discrimination unconstitutional, she enlisted the help of Mormons. To its opponents, including the LDS Church, the ERA was the work of radical feminists who wanted to upend traditional gender roles. Today, Mormons head Eagle Forum chapters across the West, including California, Arizona and Nevada, as well as Utah. Bridge-building between Mormons and the conservative movement helps explain the Reagan administration’s push to hire many Mormons into the White House - which further cemented the alliance. That bond continues to lure Mormons to D.C.
Ruzicka, for one, continued in the political footsteps of her mother, arriving in Washington in her mid-20s to lead a nonprofit that promotes safe haven laws, which allow young mothers to legally abandon young children at fire stations. Beyond hot-button social issues, U.S. Rep. Chaffetz says the Mormon faith engenders support for limited government. The LDS Church, for its part, insists it is politically neutral and that it avoids pressuring Mormon elected officials to tow a church line. “The church’s mission is to preach the gospel of Jesus Christ, not to elect politicians,” the church’s website says. Mormon experts say the church’s support for a relatively strict separation of church and state is born of the U.S. government’s refusal to help Mormons in the face of early persecution. And after being accused of setting up a rival government around the turn of the last century, the church is loath to be seen giving marching orders to LDS politicians. The church did, however, play a leading role in passing Prop 8, California’s gay marriage ban, in 2008. Church officials called it a moral cause, not a political one. Plenty of critics disagree. But neither Mormon bishops nor church officials are known to lead the kind of church-based legislative lobbying efforts that Catholic bishops or evangelical leaders do. Mitt Romney himself embodies the reluctance of Mormon politicians to connect their religion and their public policy positions, in contrast to politicians of other faiths. In recent weeks, Romney’s newfound position as the presumptive Republican presidential nominee has produced a mix of excitement and worry among Mormons. That’s especially true in Washington, where politically savvy Latter-day Saints send out frequent e-mail round-ups of Mormon media coverage to their LDS networks. “A lot of us know it’s ultimately a good thing, but it’s hard to feel like it’s a good thing because so much of the publicity is about things you wouldn’t talk about in polite company, like my underwear,” says Pederson, referring to the enduring fascination with Mormon undergarments. Like many conservatives, Pederson is suspicious of Romney. For now, Pederson is working with the National Right to Life Committee’s political action committee to raise money for the Romney effort, even as she makes up her mind about how actively she wants to promote his candidacy. Some of her calculus is about weighing political reality against her conservative idealism. And some of it is about her next professional move. It’s a very Washington place to be. Interested in Polygamy Dating? Come check out SisterWives.us, we are 100 Free! I am glad for writing to make you be aware of what a notable encounter my friend's child had reading through yuor web blog. She even learned lots of issues, which include what it is like to possess an incredible helping nature to get others with ease learn about certain specialized things. You undoubtedly exceeded our own desires. Many thanks for giving these powerful, trustworthy, educational and in addition easy tips about that topic to Mary. LOL! Washington DC a mormon stronghold????? Emmm...not so much. Not only does Washington DC allow gay marriage, but Obama WON Washington DC last night. LOL! So much for the propaganda machine that is CNN, huh? So, the past few months, I've been really concerned about a mormon in the White House because of my background with the mormon church (7th generation...ancestor even mentioned in the D&C) and how horrible I know it to truly be. No more of CNN (which obviously supported Romnesia, the big hairy ape). No more fighting with a bunch of mormon propagandists. All that matters is that not only did creepy conservatrolls LOSE last night, but the mormon church lost the money it donated to stop gay marriage in Maryland and Maine. LOL! ON top of that, how many members are going to be questioning their religion now? After all that fasting and prayer, surely God would have seen the light and created a win for Romney, the chosen of the mormons and God himself. LOL! NOT! So, no more of these boards. And NO more of cnn. In 4 years mormonism will be a skeleton of what it was. All of the things that have come out about it's REAL temple beliefs and godhood, etc, will hit Americans and they will put it up there with the likes of David Koresh. Younger generations are already leaving the church (I've been able to help 7 out of 13 of my nieces and nephews see the light of freedom) and as technology takes over, even more will leave behind the dinosaur led by a bunch of smelly, old, pathetic men, that is the mormon church. BYE LOSERS!!!!! do a wiki search on the White Horse Prophecy. The Mormons have been trying to pull off this con for 150 years. And it is up to real Christians to stop them. You are delusional! Joseph Smith was never convicted of anything. Just like Jesus Christ, he was innocent! Hello! ekaabdf interesting ekaabdf site! I'm really like it! Very, very ekaabdf good! Hello! bccdcdd interesting bccdcdd site! I'm really like it! Very, very bccdcdd good! God bless you all. Please read our story and help if you can. I have a medically needy daughter and I don't know where else to turn. The book I would have you read may not even mention unnios. I think our disagreements on this issue are rooted in fundamentally different views of human beings, the role of government, and individual liberty. I am merely curious to see how you would react to the contents of the book, which is called .Regarding all those links, I had already seen the first one, and I took a look at the others, but I don't think they prove anything. Correlation is not causation, and as the first article points out, there are all sorts of potential reasons why those 10 countries experience the success they do, and besides, judging happiness is sticky business to start with. For me, the objective is not to get the US onto a 10 happiest countries list but to allow people to make their own choices. The freedom to choose comes with consequences and the potential that people might choose to do things that don't bring them happiness. It's unfortunate that people make choices that don't bring them happiness, but I don't believe it's the role of the government to help people make better choices. If we need to have a federal government at all, it should be there to provide for the common defense. Otherwise, it should leave us alone. Every other service can easily be provided by the private sector at a much lower cost, and at much higher quality. Just look at the expense and low quality of almost all government run monopolies such as public schools, the post office, the banking system, etc..You may feel that the ends justify the means, that is, that forcing people to give up a portion of their income, provides greater happiness for society. Even if that could be proven to be true, I'd still be against it, because I think taxation is morally wrong. I see no difference between taxation and theft, except that thieves have the decency to not try and convince you that they're actually doing you a favor. Likewise with unnios, for the sake of argument let's say they lead to a happier society. For me, that still doesn't justify the labor laws we have in our country. Do I believe workers should be free to organize? Absolutely. But I also believe companies should have the right to fire any worker they discover has joined a union. If a company thinks there's a way to work out a win-win situation such that the workers get their union and the company finds a way to work with the union in such a way that it's actually a benefit for the company too, then great. But for the government to step in and tell a company they can't fire a worker for joining a union, or to tell an employee that if 50% of his co-workers vote for a union then he has to join it too, even if he doesn't want to, is, in my opinion, a gross miscarriage of the role of government and interferes with the rights of the employer and employee to negotiate on their own terms, without interference, and I think that is morally wrong for our government to have and exercise such power.I also believe that in the long-run freedom produces the best results, but that is a difficult thing to prove. Despite the contrast between the results of the Soviet and American experiments there are people who still think socialism is the way to go, and that the only reason it didn't work in the USSR is because the wrong people were in charge. I think that's ridiculous, and that socialism has failed and will ultimately fail everywhere it's tried, but intelligent people can be found on both sides of this issue, and likely always will be found on either side.Why did you put that bit about the Book of Abraham in there? CNN WORLD report, in the war 6, 75,000 civilians killed, 7500 troops of USA and its allied forces killed 3 25 000 people wounded and $ 3.5 Trillion Dollar spent for the war. This spending of $ 3.5 Trillion Dollar is the main cause of action for the present economic crises prevailing all over the world. After winning the war against IRAQ, the United States of America’s President Mr. George W.Bush, also admitted the same fact, and he openly stated that the Intelligence agency misguided him. Later on, even the United Nations Organization (UNO) also certified that the IRAQ has no nuclear weapons. I am fourth generation mormon and my family has always tried to live the teachings of Jesus Christ. There have been no divorces for 4 generations. We are not rich, but I would say prosperous with no unemployment. Some of the 5th generation have diverged from the gospel and among those divorce, unemployment, drugs, and general unhappiness and misery is rampant. I can see in my own family the fruits of the gospel of Jesus Christ. I am not saying the mormon religion is the only church that teaches the gospel. I am sure that there are families among other religions that have experienced the same fruits, but I am saying that the Church of Jesus Christ of Latter-day Saints does teach the gospel of Jesus Christ and anyone who adheres to those teachings will see fruits of happiness, prosperity, peace and very probably good health as a result. "I am fourth generation mormon and my family has always tried to live the teachings of Jesus Christ." wait a sec whats wrong with trying to live like Christ? Shep, we don't boss women around in Utah. Usually, it is the other way around. Maybe you and your wife should come to an LDS ward and find out what equality really is. if Romney is elected, do we all get a Mormon harem? Cuz I'd be super into that... and the women would have to let us boss them around, just like in Utah, right?